Here you can quickly and easily find all the tools and resources we have available to help keep your business name and company details up to date. Learn more about our online business name services. We also feature tutorials which explain some of our most popular online transactions. Learn more about our online company services. 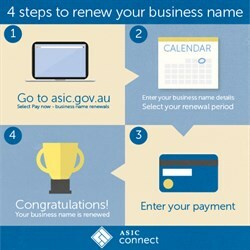 Our user guides provide step-by-step instructions for completing business name transactions in ASIC Connect. Our user guides provide step-by-step instructions for completing company officeholder transactions online. search the Business Names Register. Information about what to consider when you operate a small business. information written for Aboriginal and Torres Strait Islander people about companies limited by guarantee. These companies are commonly used for not-for-profit and charitable organisations. Our infographics explain some of our most popular online transactions in a visual way. Check a business' registration status, registration number and principal place of business. Takes you through some practical and easy checks to verify information about businesses you're currently dealing with or potential business partners. From 12 November 2016, the existing unfair contract term protections will be extended to cover small business contracts. An online training resource developed to help VET students improve their money management skills and support their future careers in small business or as contractors. Learn more about your responsibilities as a company director, including potential liabilities. Ensures that individuals and businesses comply with Australian competition, fair trading, and consumer protection laws. Provides small businesses and family enterprises with assistance and access to dispute resolution services, and advocates on their behalf. Manages Australia's tax, excise and superannuation systems. Offers information and resources on planning, starting and growing a business. A gateway to information and advice about Australia's workplace rights and rules. Information from business.gov.au about the differences between a sole trader and a company. A free online superannuation payments service that helps small businesses with 19 or fewer employees meet their superannuation guarantee obligations.